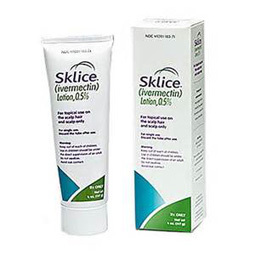 Sklice uses bacteria (streptomyces avermitilis) as an active ingredient. The product was not effective and the side-effects are potentially dangerous. REMARKS: Sklice uses bacteria (streptomyces avermitilis) as an active ingredient. The product was not effective and the side-effects are potentially dangerous. Not recommended.